New footage has emerged of Berlin in the aftermath of World War II. 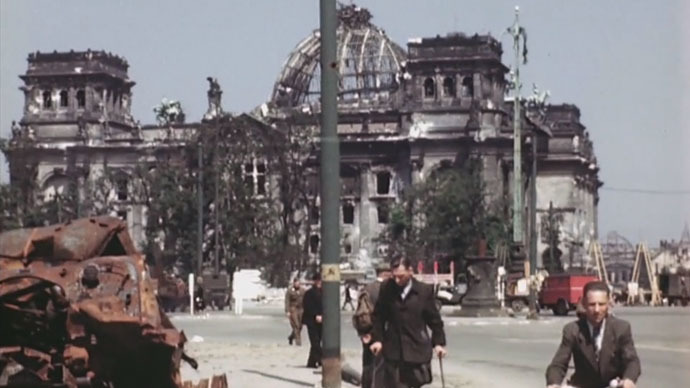 The video, filmed in July 1945, shows famous landmarks like the Brandenburg Gate and the Reichstag in ruins as ordinary citizens try to go about their everyday lives. The video, shot around two months after the city fell in 1945, shows the utter destruction the German capital underwent during WWII. Berlin had already been divided into four zones by the Allied powers, and signs in Russian had already begun to be erected in the Soviet sphere of influence. The footage, some of which had never previously been published, has an almost apocalyptic feel, as the residents of Berlin walk around the streets, despite the debris everywhere to be seen. Trams are already running through Alexanderplatz as a mix of soldiers and civilians try to get from A to B. Towards the end of the video, aerial footage shows the sheer destruction of the Unter den Linden Boulevard, leading away from the Brandenburg Gate. Buildings and blocks of flats were razed, while rubble and burnt out cars littered the surrounding area. The video was uploaded by Konstantin von zur Muehlen, who founded Chronos Media in 2001. It has access to historic film footage, which includes over 7 million meters of film roll dating back over a century. Its material from its archives has been purchased and exchanged around the globe.